Delicious Acai Banana Smoothie Bowl topped fresh fruits, chia seeds, nuts, toasted coconut and Grape-Nut cereal not only makes for a delicious morning but will also whisk you away to somewhere that is warm and sunny! What more do you want to start of your winter mornings with?! Whats a New Year without resolutions right?! For several years now, I havent really made any resolutions up until for this year. I gave up on them as I never took them seriously to stick to them. Maybe, I never really needed the change of whatever the resolution I made. So anyway, after a not so great 2016, I decided maybe it is time to make some resolutions for the new year, some that I know I will try a lot harder to stick to, as they personally mean something to me. One is to reduce my sugar intake or rather dependency on sugar, as I have a huge sweet tooth and lately I have not been too proud of that. More of that for some other time. Another is to make sure I eat something healthy and filling for all three of my meals. I tend to skip meals and compensate by eating a rather unhealthy snack or eating something that I regret later because I was too hungry and did not get time to make something good. Breakfast is one meal that I am not too proud of skipping the most. When we went to Hawaii in 2015, I remember eating acai bowls after acai bowls and I managed to successfully recreate some after coming back here and that went on my breakfast rotation, along with the regular bread and eggs. I remember loving it and wonder how I forgot all about it last year. The secret to making a great smoothie bowl is to have a variety of things – fruits, nuts, cereal or granola – something sweet, something nutty, something crunchy, something chewy – texture and taste is everything. Other wise all bites tend to be the same and you can easily get bored of it. 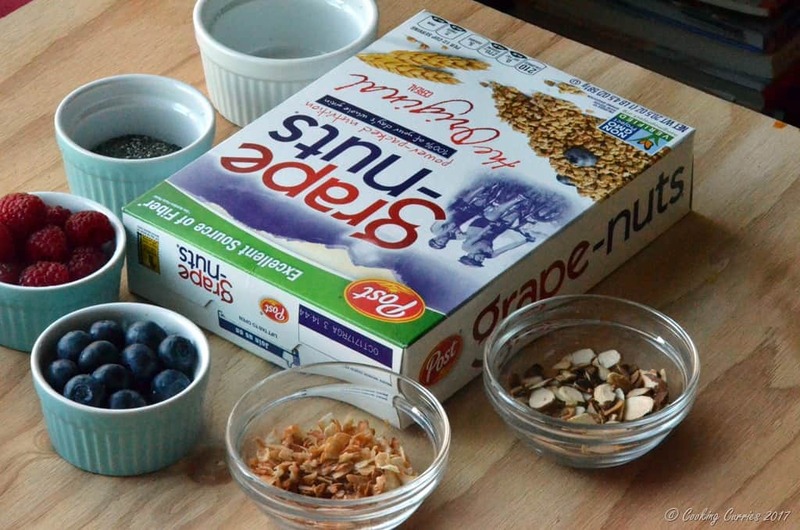 For the crunch part in my smoothie bowl, this time around, I added Post® cereal’s Grape-Nuts. These make my smoothie bowl have a little more of a substance as they have wholesome ingredients like whole grain wheat and barley. This combined with the fruits and the yogurt and the nuts in the smoothie bowl makes for a power packed breakfast that is sure to make your day great! Also they are non-GMO verified and that is a huge win in my books. 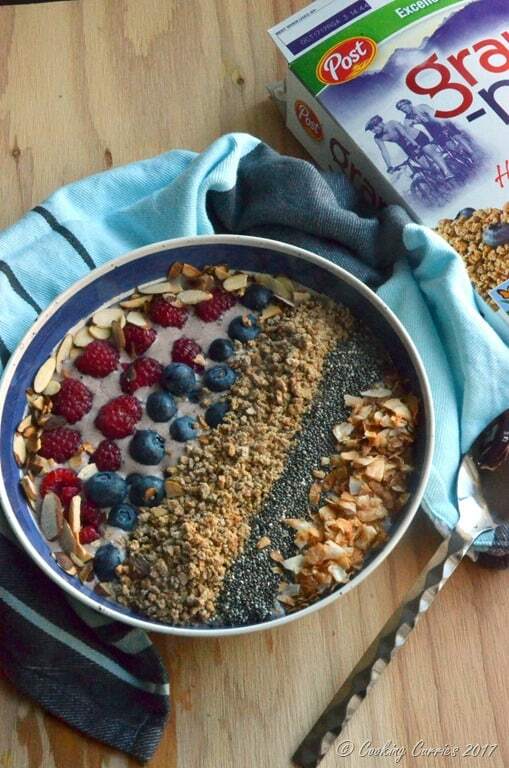 Blend all the ingredients for the smoothie bowl well. 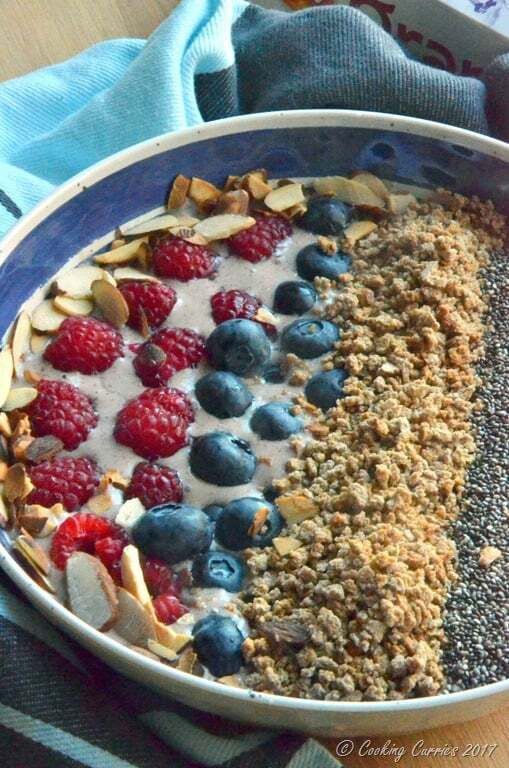 Pour the smoothie into a serving bowl. Add all the toppings in sections on top of the smoothie. Enjoy spoonsful of goodness! Nice healthy breakfast. Is this a staple breakfast in Hawaii? This is a staple in Brazil and they have it in all the fruit juice shops (which are in every corner, btw) but the last time I ate this was in Oahu, Hawaii and I fell in love with it all over again that I would go eat almost everyday! ? then finally I got the powder from that store back home ? What a glorious collection of ingredients, sounds like a good way to start the day. 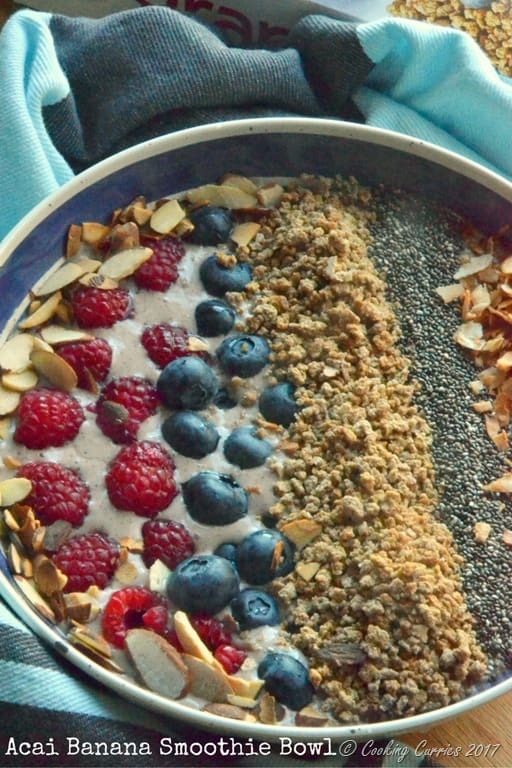 Your acai breakfast bowl looks so beautiful it would get anyone out of bed! I love lots of texture in my meals, so this is perfect for me. Yum! I love me a smoothie bowl! Especially when it is beautifully presented with all the toppings like this. Good for you for watching your sugar. I think it’s great when consumers become aware of all of the places added sugar is used. I’m sure you just read that there is a big nutrition label law change happening, so that should help you on your mission.